Boyds, MD (Sept. 5, 2017) – Washington Spirit Academy teams from Maryland and Virginia took part in the historic launch of the U.S. Soccer Girls’ Development Academy on Saturday, kicking off the inaugural season with match-ups against PA Classics and New Jersey’s Cedar Stars Academy. A total of 69 clubs from around the country, including nine National Women’s Soccer League clubs, are fielding teams across the four age groups (U-14, U-15, U-16/17, U-18/19), with over 6,000 total players competing in the Girls’ Development Academy’s opening season. The Washington Spirit is one of three NWSL clubs to launch two Girls’ DA programs, with Washington Spirit Academy – Virginia and Washington Spirit – Baltimore Armour on the Maryland side. 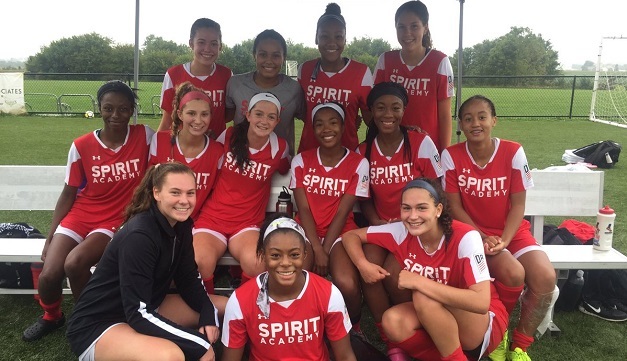 Highlighting the weekend were the Washington Spirit – Baltimore Armour U-16/17 and U-18/19 sides, who earned 1-0 and 3-2 road wins against Pennsylvania Classics. The U-16/17s earned the first win in Spirit Academy history, as Camber Hayes netted the only goal of the game midway through the second half, and goalkeeper Sofia Roberts recorded the clean sheet in net, highlighted by a tipped save off the crossbar in stoppage time to preserve the lead. At the U-18/19 level, Washington Spirit – Baltimore Armour opened the season with a 3-2 victory against PA Classics, sparked by a three-goal first half. Juliana Lynch put Spirit – Armour up 1-0 in just the third minute, before Meaghan O’Donovan and Leyah Hall-Robinson added to the lead with strikes in the 25th and 44th minutes. The Spirit – Armour U-14 side picked up a point in its first ever league match, playing PA Classics to a 1-1 draw. Dani Todd struck the net in the 14th minute, while the defense limited PA Classics’ attack to a lone score in the 25th minute. In a hard-fought U-15 battle, Spirit – Armour came up just short in a 2-1 result against PA Classics. Cate Shepherd found the net for the team’s first goal of the season in the 16th minute. On the Virginia side, the Spirit Academy U-14s and U-15s hosted Cedar Stars Academy at the Maryland SoccerPlex, and unfortunately did not get the results they had hoped for, falling 4-0 and 6-2 against a pair of strong Cedar Stars teams. Isabella Bruzonic scored the first goal in Spirit Academy – VA history, finding the net less than five minutes into the game for the U-15s. Alexandria Jones became the second goal scorer for the Virginia side, netting a goal in the 53rd minute.